The August flower is the Gladiolus. 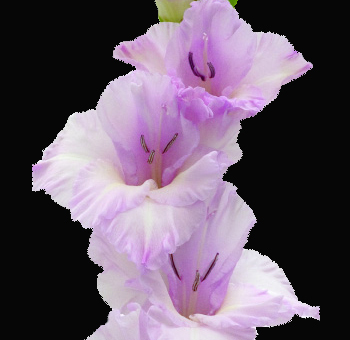 Discovered in South Africa in the 17th and 18th centuries, the gladiolus was used as a food. In ancient Rome, gladiator battles were fought ‘to the death or gladioli’ where the victor was buried under gladioli by cheering crowds in celebration for winning the fight. The name for the flower is from the Latin word ‘gladius’ which means sword, a reference to the shape of the plant leaves. Hybridization and experimentation started around 1800 in Britain with the earliest known Africa gladiolus grown in Europe dating back to 1680. Europeans were aware of this flower for centuries as an inhabitant of fields where corn grew around the Mediterranean Sea. Europe received the first South African species of gladiolus between 1739 and 1745. They were delivered by Dutch and English ships that stopped in Cape Town for supplies and water. The first English hybridization took place in 1806 by William Herbert. Gladioli are also the symbol of the Four Days Marches in the Netherlands. In fact, the oldest city in that country, Nijmegen, changes the name of one major street there to Via Gladiola once a year and welcomes walkers on the last day of the Four Days Marches. They are celebrated as heroes and spectators present gladioli to the walkers to honour them. The Dutch have adapted the ancient Roman chant to a modern day saying which roughly translates to ‘death or the gladioli’ in English. The meaning of the chant is ‘all or nothing’ and as the flower has become a sign of strength and victory – as the reward presented following a great achievement – the expression of honour is extended to the walkers participating in the Four Days Marches. The symbolic gesture signifies that the walkers are viewed as being as heroic and the ancient Roman gladiators were in their era. Dame Edna Everage, a well-known Australian comedian, used the gladioli as her signature flower and the glad is also the flower associated with a fortieth wedding anniversary. “Love At First Sight” is the meaning of this flower when offered as a gift.